(Bloomberg) -- With Paris simultaneously playing host to China’s president Xi Jinping and a Huawei Technologies Co. launch event, international onlookers might’ve expected cybersecurity concerns to be a talking point this week. But it’s not. French President Emmanuel Macron and his advisers avoided any public discussion of contentious issues at a Tuesday morning event to mark the state visit, while Huawei focused on promoting its consumer brand by unveiling the P30 smartphone line in front of some 1,500 people in the French capital. “I don’t believe in in the efficiency of confrontational postures, but in a demanding spirit of cooperation,” Macron said at the state visit event, standing next to Xi, under the glass ceiling of the Elysee presidential palace reception hall. 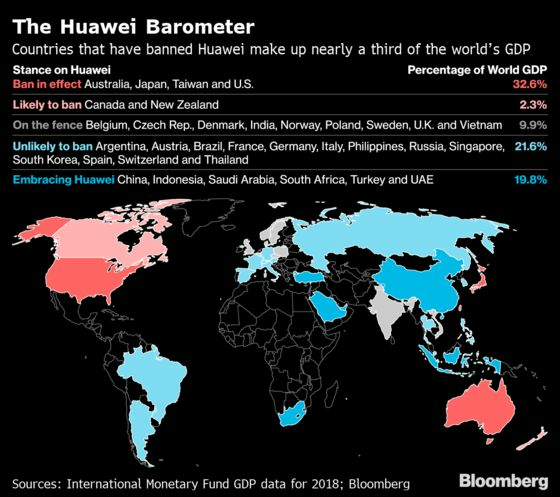 The atmosphere in Paris is the latest demonstration of Europe de-escalating what’s been a tense few months of U.S.-led anti-China tech sentiment, centering around Huawei. As part of Xi’s visit, Macron invited German Chancellor Angela Merkel and European Commission President Jean-Claude Juncker to join the state visit on Tuesday morning. Macron’s words reflected France’s ongoing strategy to stealthily safeguard its communications networks while avoiding explicit conflict. The country is planning to pass a new bill in Parliament next month to strengthen security requirements for suppliers of future 5G mobile networks. But the public tone from government officials, as well as telecom executives, has grown more conciliatory. Huawei is also keen to focus on what it sells, rather than defending against allegations of enabling spying. Executives in Paris this week steered clear of security talk to instead discourse at length about what colors its new P30 smartphone will be available in, the quality of its four cameras, and its new speaker technology that makes it harder for calls to be eavesdropped in public places. Its unveiling comes about a month after the company revealed the expensive MateX -- a model that unfolds to become a small tablet computer, and supports next-generation 5G wireless technology. Peter Gauden, product marketing manager at Huawei, told reporters at an event ahead of the Paris launch that the company wasn’t worried that consumers would want to wait for the more cutting-edge folding device. “It’s a completely different audience,” he said.